The SpartanMC is a soft-core processor and the heart of a SoC-Kit for FPGAs. Typical processors for SoC design are 8 or 32 bit cores. Small bit widths has the advantage of a small resource footprint for simple applications, but that also imply a limited complexity. Wide instructions enables much more complex applications, but will also require large amounts of memory even for small applications. The SpartanMC fills the gap between those extremes with an 18 bit processor which aims at applications of medium complexity. 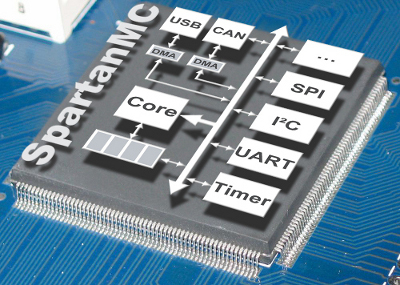 Since modern FPGAs use 18 bit width arithmetic units and memory the SpartanMC fits those hardware structure perfectly. The SpartanMC SoC-Kit delivers a full development environment for FPGA based SoCs which can be used by developers even if they have no detial knowledge about FPGAs. It contains a synthesizeable 18 bit processor core, a wide range of typical peripheral components and a software toolchain (GCC, BinUtils). Moreover, it supports the designer with a cycle accurate simulator and a graphical system builder application.